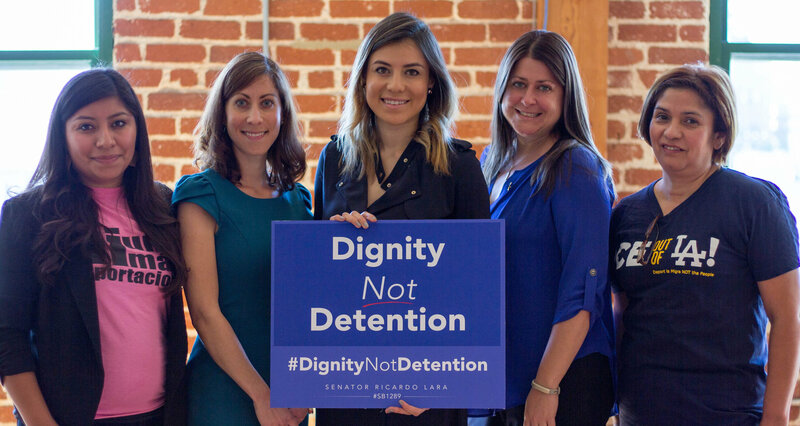 Today, as part of a broader #Fight4CA legislative package, Senator Lara (D-Bell Gardens) re-introduced the Dignity Not Detention Act, co-sponsored by Community Initiatives for Visiting Immigrants in Confinement (CIVIC) and the Immigrant Legal Resource Center (ILRC). This bill is in line with the Department of Homeland Security’s vote on December 1 to phase out the use of private contracting in its immigration detention operations. The Dignity Not Detention Act directly addresses the findings of Homeland Security’s recent investigation of for-profit facilities. Homeland Security found the mistreatment of immigrants in confinement to be systemic and especially stark in for-profit facilities. And DHS voted to shift away from for-profit facilities. 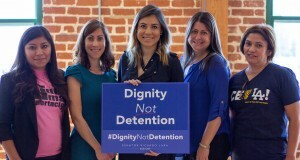 In effect, the Dignity Not Detention Act will prohibit local cities and counties from entering into new contracts with private, for-profit companies to operate immigration detention facilities in California. It also will require all detention facilities to uphold national humane treatment standards. ICE currently contracts with private companies to run immigration detention facilities. People in detention include undocumented people, asylum-seekers, long-time green card holders, and others who are awaiting their immigration hearings. In California, there are 10 immigration detention facilities. Four are privately-run and hold approximately 85 percent of detained immigrants statewide. Approximately 100,000 people were detained in California’s detention facilities last year, that is about a quarter of the total detained immigrant population nationwide. There have been consistent reports of human rights abuses in detention facilities, including physical and sexual abuse, poor access to healthcare, little access to legal counsel, and overuse of solitary confinement, and even death. LGBTQ immigrants have reported facing discrimination, harassment, and abuse due to their sexual orientation. In many of these instances, even the Department of Homeland Security has found these deaths were preventable. Tragically, the incidents often go unaddressed and victims have no recourse. Private, for-profit immigration detention facilities present a host of problems. The facilities are not subject to the Freedom of Information Act and operate with little to no oversight. Many also operate under contract incentives where they are guaranteed a minimum number of immigrants in their facility at all times, ensuring their billion-dollar profits. Currently, ICE has a set of Performance-Based National Detention Standards in place, but they lack any real enforcement mechanism. The Dignity Not Detention Act would be the first state-level bill to codify these standards into law, and provide redress for immigrants whose rights have been violated. “Immigration detention in the United States has become a financial market where people’s lives are being treated as profit. This bill is a clear step in the right direction,” said Sylvester Owino, an asylum seeker from Kenya who spent 9 years in immigration detention, primarily in California. “While in detention, my religious freedoms were often violated. As a Muslim, my religion calls me to prayer at certain times of the day. Many times, officers forced me to choose between having breakfast or lunch and practicing my faith. I would always choose prayer, but this meant that many days I went hungry,” said Mohammed Kamal Deen Ilias, an asylum seeker from Ghana, who was detained at Adelanto Detention Facility from April 17, 2015, to February 5, 2016. “Taking your dignity and pride is one thing, but taking away your dreams, what’s after that? In immigration detention, you feel helpless. You feel impotent to the system. You don’t know what’s going to happen next. Psychologically, you start deteriorating,” said Carlos Hidalgo, a father and grandfather of U.S. citizens, who was held at Adelanto Detention Facility for over a year. “In the beginning, the Department of Homeland Security sent me together with my daughter to James Musick Facility. After two weeks, DHS separated me from my daughter. I was sent to the CCA facility in San Diego and then to the GEO facility in Adelanto. They didn’t tell me about my rights and made arbitrary decisions. They put me into segregation, abused and tortured me and compromised my physical integrity to a point that I was in need of a wheelchair,” said Petra Albrecht, a mother originally from Germany who was held in immigration detention for over 1 year.